Today's video games are immersive experiences with production levels that blur the line between game and Hollywood blockbuster. Game consoles like the PS4 and Xbox One have become a hub for leisure and social interaction, with Netflix and Hulu's ever-expanding HD quality content keeping smiles on the faces of the home theater connoisseur. Advancements in technology have not been limited to only gaming consoles, though. Over the last few years, home theater projectors have become truly viable choices — with prices that are well within reach for the average consumer. Why turn to a flat screen TV when, for just a few dollars more, you could immerse yourself in the big screen action with a home theater projector? While most 'gaming' projectors are also great for watching movies, the reverse cannot always be said of every great home cinema projector. If you're serious about your gaming, there are a few things to consider when making your purchase. VGA, SVGA and XGA projectors may be ok for showing a Power Point presentation when you're at the office, but for true home entertainment, 1080P HD is the only one way to go. 4K is making great strides, but standard 1080p is still the dominant resolution in most households. The great news is that there are plenty of HD projectors specifically designed for home theater and gaming at affordable price points. When determining projector brightness, the ambient light from your viewing location and the desired image size are the two most important factors to consider. Unless you're geeking out in your pitch black basement or media room, brighter is almost always better, but it will add to the cost of the projector. Start with the brightness you need and invest in a few hundred more lumens if your budget allows. Some ambient light rejecting screens made for bright rooms can help quite a bit as well, but they do cost more. 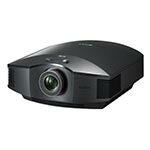 For the best image in a gaming projector, pay close attention to contrast ratios. Many of the most popular games include high dynamic color ranges allowing for very dark moments of game play. Higher contrast ratios present those shadowy scenes with greater clarity and visual acuity. In fact, a high contrast ratio often gives you a brighter looking image. Input lag is amount of time it takes for a projector (or TV, monitor) to create an image. Long input lag can make it look like your favorite TV show has bad lip-sync issues and can turn that competitive match of Call of Duty into a frustrating, controller-chucking experience. Some amount of input lag is inevitable, as consoles and PCs ofter have to connect to third party servers for multiplayer matches. Server lag times of 50ms are not uncommon when playing online, which is not horrible, but certainly not great. If online multiplayer is your preferred arena for comptitive combat, you're probably using a gaming monitor and/or a plasma flat panel TV, since they both tend to have very low input lag rates. 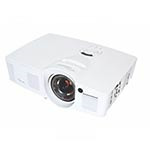 The good news is there are a few projectors available today that offer very low lag times; Optoma GT1080DARBEE and Optoma UHD60 4K UHD Projector are two that come to mind right away. Most casual gamers won't even notice a bit of lag while gaming, especially if they're playing offline. If you fall into that category, any of these gaming projectors will work great. We should note, however, that most manufacturers do not measure lag time statistics for their projectors as of yet, so we are basing our current recommendations on tests done by third party sites such as projectorcentral.com, projectorreviews.com and the avs forum. Make sure your input resolution matches the display resolution. If you're projecting from your computer, make sure you downscale that sick 4k resolution to 1080p / 16:9 and ensure your projector is set to the same. Any scaling done on the projector will introduce a bit of lag. Check to see if your projector has a 'gaming' or 'fast' mode. This typically reduces image quality by a small amount, but can also shave dozens of ms of lag time. Connect directly to the projector from your game. In a lot of home theater setups, the console/pc may run through a home theater receiver first, which introduces one more thing the signal has to travel through before reaching the final display. The fastest route is also the shortest. Gaming is no longer something nerdy kids do in their bedrooms; the gaming culture is vast and growing everyday. Parents game with their kids and kids game with each other — all across the world. At one time or another, every gamer has sat in the movie theater and wished they could play their favorite game on that giant screen. And now they can. Game on.